Fitbit Surge is the fitness tracker that has so many new features, the start-up company behind it calls it a “superwatch” next to the more normal Fitbit Charge and Fitbit Charge HR. There’s good reason for that label. The final version I tested has built-in GPS, a heart-rate monitor and real-time workout data, all fan-requested capabilities that raise the price. It’s certainly a step up from the Fitbit Force that was recalled for causing skin allergies and never saw its promised smartwatch functionality, though a few more rashes have been reported. At $250 (£200, AU$350), Fitbit Surge reclaims lost territory and squares off against just as pricey fitness trackers, like the Basis Peak, and pricier ones, like the Garmin Forerunner 920XT. Yes, its specs make it the most powerful Fitbit yet, but is it ahead of this stepped-up competition or gym class-awkward among its brawnier peers? Time to put it through my paces. Designed for workout performance, the Fitbit Surge fastens a noticeably larger LCD display to your wrist, and it’s able to easily cycle through multiple stats. Gone is the single-line OLED. This backlit, always-on interface allows you to keep tabs on your steps, miles, active minutes and heart rate on a black-and-white, 1.25-inch screen. Fitbit Surge upgrades to a touchscreen, and puts three physical buttons at your fingertips. It’s just more control to set everything from workout timers to GPS tracking to music controls. The display is not in color and doesn’t fit as much information on one screen like the Garmin Forerunner 920XT, but now there’s no need to cycle through by pressing a single, tiny button. I do wish that the Fitbit Surge included an option to cycle back to the current time after a while – and came with additional faces besides the four preinstalled watch faces to make the watch portion more relevant. An update could easily fix these oversights. Tucked underneath the watch band is an optical heart-rate monitor and at ends of the straps is a strong wristwatch clasp that is easier to fasten than Fitbit’s usual two-pronged approach. I nearly lost my Fitbit Force in a parking garage before driving 30 minutes away and then 30 minutes back to fetch it – all because of that previous ill-conceived design. The new watch clasp is two Fitbit-sized steps in the right direction. It’s also available on the Fitbit Charge HR, but not the Fitbit Charge, so avoid that version if you tend to lose things. At its thickest point, the watch case is half an inch thick off the wrist and its strap is an inch wide. That’s about 1.5 times wider than the Fitbit Charge HR band and tough to hide. The large, rubber-coated lugs at the top and bottom of the Fitbit Surge make tucking it into a shirt sleeve an extra workout Fitbit failed to advertise. Fitbit Surge now has a total of eight sensors crammed into its large frame, which, along with the LCD touchscreen, accounts for its expanded size. This means it can track all sort of movements beyond a fitness gadgets’ routine metrics of steps, distance traveled and calories burned. An altimeter, for example, is here to monitor how many floors you’ve climb in a day. That’s a stat that’s not available in all Fitbits, including the popular Fitbit Flex. GPS is a completely new sensor to the Fitbit family. It can map your runs using Google Maps while generating step-by-step graphs for elevation, pace, heart rate and calories burned. The best part is that Fitbit Surge’s satellite tracking works without your phone. You can leave that at home, a feature that’s not available in the new Apple Watch. There’s something motiativing about reviewing your entire run laid out on a familiar overhead map and trying to best it the next time. You know you need to push it at certain landmarks. Fitbit Surge’s GPS tracking isn’t the most accurate I’ve tested, with noticeable smoothing around corners and, at times, off-track routes that are a street and a half over. All is not lost, however, as these GPS errors are few and far between. More often, I found Fitbit’s always-inflated step counts to push me to my 1,000 steps goal faster than expected. My higher-than-normal step count did stay consistent. That made day-to-day goal-beating just as important and at least kept me consistent with my friends and family wearing older Fitbits. Run tracking, without or without GPS, can be initiated right from the watch, so there’s no need to go to the app screen or press a secret pattern of buttons to get started. The full list of exercise shortcuts are weights, elliptical, spinning, yoga, workout, stair climber, circuit training, bootcamp, kickboxing, tennis golf, walking and, yes, even martial arts. A post-launch Fitbit Surge firmware update has been announced in order to bring bike tracking to that list. The new software will also bring Multi-Tracker Support so you can wear as many Fitbits as you want. Needless to say, I never felt robbed of fitness tracking modes with the Fitbit Surge. The app also has a menu for food planning, but it remain cumbersome to track and is worthless. All of the collected data syncs to the Fitbit app as well as an easier-to-study web interface, a bonus that the mobile-only Jawbone Up products don’t offer. Really, it’s an optical heart rate monitor that sits on the underside of the watch and reflects a pair of green LEDs off of your skin to calculate changes in blood volume. This HRM technology is no different what’s found in the Fitbit Charge HR, which keeps tabs on your beats per minute. But the Surge does have a helpful trailing BPM indicator on the LCD. And it’s wholly better than the heart monitors found in earlier fitness trackers, like the Withings Pulse O2. Those forced users to pause to calculate their heart rate. Fitbit Surge’s heart rate monitor constantly measures your beats per minute and is accurate unless you’re extremely active. Its does a better job with that all-important resting heart rate. Of course, I’ve always found the chest-mounted Polar Smart Heart Rate Sensor tell the truth vs any wrist-worn HRM. But as an all-in-one solution, this Fitbit works fine in most conditions. Its always-on LCD also fixes the problem we had with the Fitbit Charge HR heart rate monitor. That version’s display went to sleep, complicating running and actively watching your BPM. Sleep tracking, when it works, is a bonus feature that’s just as important as any wide-awake health metric. The problem is that it doesn’t always work in fitness trackers. Jawbone Up24 is the perfect example. It logs fairly accurate wake/light sleep/deep sleep stats for us, but too often we forget to set it to the sleep mode. Or forget to wake it in the morning. Fitbit Surge remedies that, along with the Fitbit Charge and Fitbit Charge HR, with automatic sleep detection. It starts logging sleep within minutes of dozing off. It sure beats having to set the band into sleep mode with a long press of a button. That was always a little backwards and now it’s fixed. The only thing you need to set is the convenient silent alarm that vibrates to wake you and not the person next to you. Sadly, Fitbit is known for providing a very basic sleep timeline: asleep in blue, restless in aqua and awake in pink. Worse, Fitbit Surge’s patterns don’t always reflect other trackers. I found it to be harder to read my overly simplistic sleep timeline vs the minute-by-minute sleep analysis provided by the Jawbone Up24 and Basis Peak sleep tracker. What the Fitbit line really needs is a new way of displaying the sleep tracking data it collects. Its scrunched-up timeline is hard to read, so the automatic sleep detection is less meaningful. Fitbit Surge’s sleep tracking feature is a fantastic idea, one that’s just as important as steps, but it doesn’t follow through with anything that can be considered accurate or helpful. Fitbit Surge comes through with overdue smartwatch capabilities in a big way, thanks to its oversized square display. This shows a scrolling Caller ID from incoming calls and SMS alerts that can be read in full. Is a call or text worth pulling your phone out of your pocket or should you keep on running? The Fitbit Surge solves that problem and also gives you control over your mobile music with a few swipes or taps on the new wristwatch. Double tapping the left button brings up a hidden menu for interfacing with your phone’s music. I used Google Play Music and could skip tracks, pause and play music. Music playback did require enabling Bluetooth Classic, which was confusing at first and drains the battery quick. But it was effective once I re-synced the watch to my phone. Just don’t expect to store music on the watch itself. 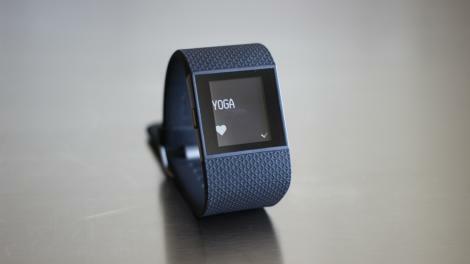 Fitbit Surge is large enough and doesn’t need internal storage to make it even bigger. Chances are, if you own a modern day smartphone, Fitbit Surge works with it. That’s because the necessary app is compatible with iOS 8, Android and Windows Phone handsets. Fitbit is the first mainstream wearable manufacturer to invite Microsoft’s loyal customers into the fitness stats-syncing fold, and it actually goes a step further on Windows Phone 8.1. Testing it out on my Nokia Lumia 830, I was able to tell Cortona to log food and activities with the sound of my voice. Saying “Fitbit, I ate a salad for lunch” searched the database of 350,000 foods. This would make Microsoft’s platform the ideal choice for Fitbit users, but food logging is still too complicated in the end. I was forced to describe the salad and its size to a nauseating degree. The Fitbit ecosystem is all-around more inclusive except when it comes to Apple Health. Sadly, the fitness-focused startup as opted out of syncing its data with iPhone’s wellness app. Fitbit Surge is as waterproof as a smartwatch gets by matching the Pebble Time and Pebble Time Steel, according to the official specs. It’s listed at 5ATM, okay for a depth of 50 meters or 164 feet. I didn’t have any problem submerging my Fitbit Surge for a few minutes. It didn’t brick my $250 gadget and will almost certainly survive lengthy, sweat-filled workouts or heavy rain. Fitbit Surge excels in a lot of areas, but it falls behind its predecessors when it comes to battery life. That’s expected given its large black-and-white LCD and new GPS capabilities. The problem is that Fitbit promises its new “superwatch” can last seven days with heart rate monitoring and activity tracking enabled. It advises turning off GPS and music controls. My Surge didn’t live up to that stamina in tests. It gave me about four and a half days between charges before it quit, even when minimally using its GPS capabilities during the week. Given the Apple Watch, every Android Wear watch and my phone require daily charging, that’s more than acceptable. It takes about an hour and a half to recharge a Surge. What’s infuriating is that Fitbit Surge uses a proprietary charger – one that’s different from the two other recently released Fitbits. At first, I was excited to see that the Fitbit Charge used the same proprietary USB charger as the Fitbit Force. I had two of the same charger. Then I got the Fitbit Charge HR, which had a slightly different charger, and then the Fitbit Surge, which had its own unique charger. What? Yes, I now have three brand new Fitbits with three different chargers. The company lost its chance at creating a ubiquitous fitness charger among its ecosystem. This is, without a doubt, the most powerful Fitbit yet. It’s the best of its brand, thanks to the ability to track GPS-mapped runs without a phone, control music on the run and check your heart rate in real time. There’s a lot going on within this sensor-filled fitness tracker, and it has a 1.25-inch display to prove that all the metrics are working at the same time your blood is pumping. Best of all, it syncs with newer Windows phones in addition to iOS and Android devices. Fitbit Surge tries to be a jack-of-all-trades, master of “run,” but it falls short in every way. It’s not as accurate as the Garmin’s top-tier fitness tracker and not as subtle as an activity band. It’s big, bulky and doesn’t have all of the premium features to back up its size. Its sleep tracking capabilities haven’t evolved, the steps count is still inflated and the fact that this is the third recent Fitbit with the third proprietary charger is a joke. Why must they all be just a little bit different and incompatible with each other? I’d also ask for a color e-paper display instead of a black-and-white LCD, but the battery life is already shorter than advertised. Fitbit Surge is meant for budget-conscious power users who are in need of a smarter running accessory. In this way, it runs laps around Fitbit’s more casual wearables, like its Fitbit Flex or Fitbit Charge, thanks to GPS-mapped runs, basic music controls and smartwatch-like notifications. The catch is that Surge is still designed to be worn on a daily basis. That doesn’t work out, because it’s shaped like a clunky running watch. It’s significantly bigger than every other Fitbit and doesn’t blend in with normal wear. That’s the price of having a built-in GPS, a touchscreen interface, a heart-rate monitor and automatic sleep tracking. 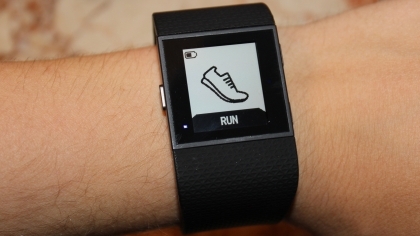 Fitbit Surge is set up to fill the void between a fitness tracker and a real running watch. It does that, but is only recommended if you can’t afford the more reliable Garmin Forerunner 920XT.